We’ve compiled some simple tips so that you are can keep Caravan-Truckie relationships happy and healthy when out on the open road. It’s about using common courtesy on the road (this goes both ways of course) and using your radio to communicate effectively. UHF Radios are a great way to keep in contact with your vanner friends (Channel 18) and can also be very useful in communicating with truckies. 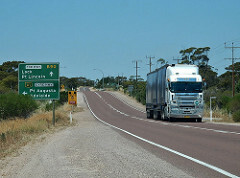 Contacting a truckie via UHF is a great way to let them know it is safe for them to overtake you. Direction you are going –southbound, northbound etc. Once you know these details you can start making communication with the truck driver behind you. A conversation along the lines of the one below should help both you and truckie organise a pass on the highway. The caravaner should then lay off on the speed and move over to the left-hand fog line. Don’t veer too much as you want to stay safe and moving at a good and non-jerky pace. This way the truckie can get a good view of what’s coming and determine whether they can overtake. Caravaners should keep a constant speed making sure not to speed up or down. Once there is a comfortable distance between the front of your car and the truck let them know. Caravaner – “You’re clear southbound” or flash your high beams a few times. The truckie will then merge into your lane and be on their way! Some vanners don’t like to hear the chatter of radios so if you don’t have one there is still a way to let truckies know it’s fine to pass. Flash your right-hand blinker a few times and maintain your current speed. If the truckie thinks it is safe to overtake they will indicate and move right a nd only once they have cleared the car should you slow down. Once the truck is a safe distance in front of your caravan let them know with a flash or two of your high beams that they can merge into your lane. There’s certainly no need for anyone on the road to feel pressure to pull over, speed up or slow down so following these tips can help you feel safer and help truck drivers stick to their budgets. Feature image by Bob Adams on Flickr.